Time flies much faster than we think. Ask me how long I’ve been shooting digital and I would say 10 years. When I checked, it’s over 15 years. And in that time, I’ve built up a huge catalogue with hundreds of thousands of images. That’s a significant investment in time and something that could never replace. Do I look after this valuable asset? Not as well as I should. As my catalogue’s grown I haven’t pruned it to keep only the good images. It just keeps on growing as I shoot and download more images. More importantly, my photo backup workflow hasn’t kept pace with all this. I keep meaning to do something about it, but there’s always something more important to do. Let’s be honest, copying image files isn’t all that exciting. But then something happens to make you think more seriously. In my case, I wiped one of my computers and couldn’t recover it. But before I give you the details, it’s helpful to understand how my system’s set up. I currently use Lightroom to catalogue my images, downloading them onto a Drobo storage unit. If you’re not familiar with the Drobo, they’re just like an external hard drive, except you can slot multiple hard disks into the unit (4 in my case). These disks then act together, appearing as a single large drive to the computer. The other benefits of the Drobo are resilience and scalability. If one of the disks in the unit fails, your data is safe as it’s replicated across all the disks. You can then swap out the failed drive for a new one. It’s the same when you need more space, just remove one of the smaller disks and add a larger one. Unlike with RAID, the disks don’t need to be the same. You can mix sizes, manufacturers and even spin speeds. I have two of these Drobo units with the one attached to my iMac holding all my images. If the iMac fails, my images are safe on the Drobo and if a disk in my Drobo fails my images are also safe. If this seems like a great setup, it is, but it isn’t free from risk. Recently I encountered a problem on my iMac that’s made me realise I need to improve these arrangements. Before Christmas I decided to partition the drive on my iMac. It’s a 3Tb drive and I wanted to create two drive partitions. If you’re not familiar with partitioning, it’s quite simply. You can do it with the “Disk Utility” which splits the hard drive, so it appears on the computer as two drives, each with its own name. It should be a simple process, but something went wrong. Half way through my computer crashed. When it restarted, I had only one partition with 800Gb of space. The rest of the hard disk was missing. Apple support were very good, but eventually they admitted defeat. The only way to resolve the problem was to wipe the hard drive and start again. No problem we thought. My is Mac running Time Machine which automatically keeps a full backup of the computer. But when the time came to restore the backup, it failed. Ultimately, the Mac needed a ground up rebuild. To make matters worse, the advice was not to apply the Time Machine backup as there appears to have been a long-standing software issue. Restoring the backup would probably reproduce the problem again. Although the problem I encountered couldn’t have been foreseen or protected against, it did make me question my current photo backup workflow. Having now resolved my problems there are a few lessons I want to share, which might help you create a backup strategy of your own. I’m sure you know, it’s only a matter of time until your hard drive fails. All drives fail eventually so you need some form of resilience in your image storage. In my example, the Drobo provides this. It’s possible for two of the four disk drives in the unit to fail and for my image data to remain safe. But if your images are on a single hard disk, you have a weakness in your storage resilience. Be sure to maintain and update a second copy of your images. Many people store their images on their computer’s hard drive. I used to do this myself, before starting to use external hard drives. I came to realise the computer isn’t the best place to hold images when I had to buy a new one. I had to move all my images onto an external hard drive just to transfer them to the new computer. That’s when I realised an external drive was the best place for them. You probably find you need to change computers more frequently than you need to replace a failed disk. Having your images stored on separate storage to the computer makes it easier to swap your computer when the time comes. Although the megapixel race has slowed, image size is still increasing and placing heavy demands on storage. Fortunately, hard disk capacity is keeping pace and storage has become very affordable. I recently purchased a 5Tb Seagate disk drive for £120. In a couple of years, I will probably be able to by a 10Tb disk for the same price. But if you store all your images on a single drive, when that’s full you will need to buy a bigger one. You then have the headache of transferring your images over to the new storage. It can take days. A single disk drive housing that allows you to swap out drives to expand storage may work out more cost effective and easier to maintain. The downside to disk housing units like the Drobo is portability or rather lack of. These units aren’t something you can pop into your pocket which creates risk. If your images and computer are at the same location, your exposed to the risk of fire, a flood, a robbery; you can still lose everything. But if you have a portable backup at another location, you reduce your risk. The ultimate in portability is the cloud. If you hold images in the cloud, you can have access from almost anywhere. Your data is also backed up automatically by the cloud company. Unfortunately, it can be costly, and you need a very fast upload speed, or it could take you days to store each photo shoot. My own arrangement is a 2.5” portable hard drive which backs up the images on the Drobo. Holding this offsite means I have a safe backup of my image library. Being human, it’s easy to forget to update your backups. That’s why it’s important to automate as much of the process as possible in your workflow. You can then get on with more interesting things, whilst your software takes care of the rest. If you use a Mac computer, you will have Time Machine installed. This can create a backup of your Mac’s hard drive and continues to update it hourly with any changes. What’s nice about Time Machine, other than the automation and how easy it is to use. You can use it to look back along a timeline to recover files from a day or time, even deleted files. If you have this, be sure to use it. Although I couldn’t restore my iMac from Time Machine I could look back and recover a copy of my Lightroom Catalogue. If I didn’t have this I would need to import all my images to Lightroom again and I would have lost all my historic editing and keywording. 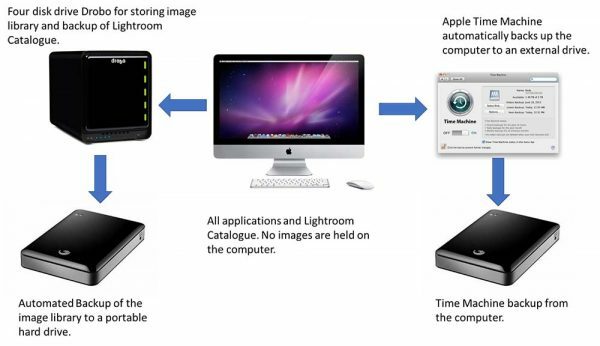 You can also use Time Machine to backup external hard drives providing disk space allows. If you have your images on an external hard drive, you’re going to need to use this feature. I found this helpful article on the internet that explains how to do it. Despite the benefits of Time Machine, it may not be the right option for you. For example, I don’t want it scanning my Drobo every hour to check what to backup. I also don’t want all my image files adding to my Time Capsule (the Time Machine backup) as it would be full in no time. A great alternative if you don’t mind spending a little money (and one I now use) is Carbon Copy Cloner. It’s very reasonably priced and very flexible. Unfortunately, it’s only available for a Mac. If you’re using Windows rather than a Mac, you also have a backup solution built into the operating system. It’s like Time Machine, you just need to configure and turn it on. If you want to know more the following article should help. But, if you’re not happy using the built in Windows backup or want more flexibility, there are quite a few third-party solutions if your willing to pay. One good option is Disk Image from Acronis. If you use Lightroom, having a backup of your Lightroom catalogue is critical. It’s the catalogue that holds all the adjustments you make to an image as well as important information such as ratings and keywords. Built into Lightroom is the option to periodically create a backup of your catalogue when you close Lightroom. I now use this to keep a backup of my catalogue on my Drobo together with my images. If you want to know more about backing up your Lightroom catalogue, I found this helpful article on the Adobe website. Ultimately, all these options need to give you one thing. A reliable backup of your computer and image files if the worst happens. Ideally, they do this automatically using a schedule you can control. This will minimise the chance that you forget to take the backup. The level of protection you create is a trade-off between competing factors. One of these is cost. How much are you willing to invest in software and hardware to implement your backups. Another is the level of risk you’re happy to tolerate. You can protect against most things if you’re happy to spend the money. But there comes a point where it’s not worth spending more money to safeguard against an extreme risk or “act of god”. Do you really want to protect your images against an asteroid strike? Work out the level of risk you’re willing to tolerate and then devise your strategy. My Drobo for example is my solution for protecting against a hard disk failure and my drives becoming full. My Time Machine protects against the loss of my iMac, the disk being wiped or my mistakenly deleting a file. My offsite image backup helps me protect my image catalogue against something happening in my office. Remember, any solution you put in place will still carry risks. If you chose to put your data in the cloud, what happens to your data if the company hosting it goes under? What happens if someone hacks into the cloud storage? You probably don’t want to protect against every possible eventuality and determining the level of risk you can tolerate is important. Keep your image back catalogue well pruned. Keeping it small gives you more flexibility in how you store and access it. It may even make a cloud-based solution viable. Try to separate your images from your computer in some way. You could create a separate partition on your computers hard drive to store your images and maintain a second copy of your computer (and images) on an external hard drive. If possible keep a backup of your backup at another location. If you do this, you will need to work out a schedule for updating the offsite backup. Where possible, automate your backup workflow and use scheduling software to help. Follow this advice and you hopefully you will be able to recover quickly should the unspeakable happen to you. I’m pleased I mentioned it now. Do let me know how you get on with the Synology solution. I’m always interested to hear other peoples views. Shall do. Please be patient however, I ordered yesterday 24tb of space (wow!). My LAN is rather crowded and the last addition – internet booster – has had some problems. TV was erratic. I was able to solve them only today morning. The culprit was/were powerLAN-adapters. I need them, although it is a very treacherous territory; one never knows, what is lurking in the power installation… Luckily, I found two at last, which understand themselves well and they do not disturb the other components. With LAN-drive I ordered an used unit to the price of the four drives in it. So I hope, the unit itself will obey me 😉. Good luck. I hope everything works well together. I bought a used 4-bays (4 x 6TB) unit, checked by the dealer. As a complete newbie, I installed the software before checking properly if the unit is OK. So only when the software told me, I have only 18TB, I started to search… After a while I found out, that the connection with one drive was faulty, but the drive was ok. Fine, I thought. I have paid approximately the price of the drives, so no loss yet, only time. At first, I wanted to buy a new empty unit, but then suddenly something made me to open the case once again and I started to take it apart. Luckily, the first plate I took out was it: Somebody has rammed one drive with force into the box and the connecting part between the drive and the plate (platine?) was skew. No contact. The part was not soldered, it only clicked back into position and all was well. Lucky boy – repaired a complex electronical device without no knowledge whatsoever!! You have no idea how proud I was. I then reset the unit and installed the software a new. I did not take the time, but it a quick affair. The question of how to reset the unit is another one: As a notorious non-reader of manuals , I took to it only when I did not know what to do. I did not understand the Manual from Synology, and so I have opened a ticket with Synology. They came back a day or two later, but by then I found help on Internet and did not need them. Since two days I am able to fulfill my social duties again and disappear only occasionly to look after the NAS. Files from all around the house are being transferred to it and prune. What might interest you: Drives are ready about 5 minutes after the start of the system, today were nearly 4TB of data on the NAS. The transfer from my desktop runs at about 20-30 MB/s, it is changing very erraticaly. Right now music files are in works and the system tells me, that for next 600 GB it will need 6.5 hours. Until now his times were rather shorter in the end. Should you be interested in more, please tell me exactly, what it would be. Thanks for the additional information. I can imagine this caused a lot of stress and well done for fixing the unit. It sounds like you have a good set up and that its working well for you. I also have my Drobo back in business and since formatting it for use on the Mac it mounts in around 30 seconds – a big difference to the 15 minutes on Windows. If you get chance and can remember, let me know in a few months time if having the NAS storage makes life easier for you. I can imagine it’s a lot more convenient but it would be good to hear this after some use. Not stress exactly, but a lot of time. Will inform you, but first have to collect some experiences. After everything is on the NAS, backup is called for. Right now I use USB drives, in individual cases and rather slow. Maybe I will come back to Drobo; the possibility of mixing drives with different capacities is interesting, I have couple of them around. We shall see. Meanwhile, thank you for your help, I appreciated very much! Good article, thank you. Until now I strived to backup my images without a backup software, which would use proprietary file format. My idea was and still is, an automated backup which leaves files in their original format (NEF, TIF, JPEG), so I could restore them individually with Windows Explorer. Now, that I reached about 3TB of images, the whole process of backing up has become difficult. My images live in folders like Travels, Home, Family, etc., Subfolders are years with one exception; Travels have firstly destinations as subfolders (Dolomites, Firenze, etc. ), and these have then years as subfolders. Often, I work on an older image in an older (sub)folder and have to remember to back it up. It seems to me, that I need a routine, which would work the whole data and backup only the changed ones to right subfolders. Do you think I am on the wrong path? Would it be a good solution to write the routine mentioned above? I would have to look up things in a book, its a couple of years I wrote small routines in Excel…. It sounds like you have created a bit of a headache for tracking your images. Personally I would be tempted to move to using a new master folder for each year and then within this a new subfolder for each shoot. You could include the lcoation name in the name for the subfolder. But, I do understand if you don’t want to do this. The best solution to your problem of backing up new images/changed images is backup software. As you mention using Windows, I would suggest you try MiniTool Shadowmaker Free (https://www.minitool.com/backup/system-backup.html). Once it’s make a backup it will only backup the incremental changes and you can schedule this to happen automatically. The free version will do everything you mention and a lot more. Thank you for your answer. I have already backup software (Acronis), but used it only for mirroring of the system (C:). Images are being backed up manually, just copy to the backup drive. I dream of a backup for images in its native format, from which I could retrieve single files. Compression is no problem. Therefore I am searching for a routine, which would backup my images in their native format, be it NEF or TIF or JPEG. The routine would copy changed and new files to the backup folder (on a NAS) daily before shut down. Hi Robert, the software I suggested does exactly what you’re looking for. The files are in their native form and can be recovered individually. The software also backs up the latest version of the image when it changes. My Mac backup (Carbob Copy Cloner) does exactly the same thing. I can recover individual files and even pick the version of the file I want from a specific date. It’s well worth investigating the backup solutions available. Hi Robert, You might also want to try AOMEI Backupper (free version). This one definately allows individual file extraction and it’s a very nice interface including a scheduler. Sorry, one more question: I am in the market for a NAS. You now use Drobo, but if you were not already invested – would you choose Drobo again or go for NAS like Synology? My dealer has both, Synology is more expensive (I am comparing 5 bays models, e.g. Drobo 5n2 vs DS1715). Do you definately need your storrage to be networked? The Drobo’s I use are USB3 which is cheaper than the 5n2 networked version. The reason I went with Drobo (twice now) is that a lot of the NAS drives I checked wanted disks to be matched so they had the same size and spin speed. This would mean quite a lot of expense each time I came to add more storage. With the Drobo I don’t need to worry about that. I just need a standard SATA drive. I still like the Drobo even though a lot of people will tell me there is better available. The Drobo is flexible and fits my needs/budget. Anyway, I wanted to thank you for your sites. They are places I can learn and find lots of ideas! Thanks Robert. One other point about the Drobo that you might consider a problem if using it on Windows is the slow loading. When it’s formatted to use NTFS, it will take around 1 minute for each TB of format size to initially mount. One of mine is formatted to 16Tb and takes about 15 minutes to initially mount. The same is true if I mount this drive on my Mac and the delay seems to be a feature of the format rather than the Drobo. My other Drobo has been formatted on the Mac and mounts in around 10-20 seconds. I don’t know if this is a factor for you if you’re going to use it as a NAS. Thanks Hugh. I hope it does encourage you. I’ve been in the position of nearly losing all my images a couple of times. Fortunately I have always managed to recover but it’s not a nice place to be in. 2008 iMAC – no photos or video stored on this. I’m likely to upgrade to a new iMAC within 2 years. Freecom ext. drive – 21000 photos and growing. I’m worried about the Freecom drive holding all my photos even though I’ve got the Time Machine backups (stories of Time Machine failing to restore don’t help either). 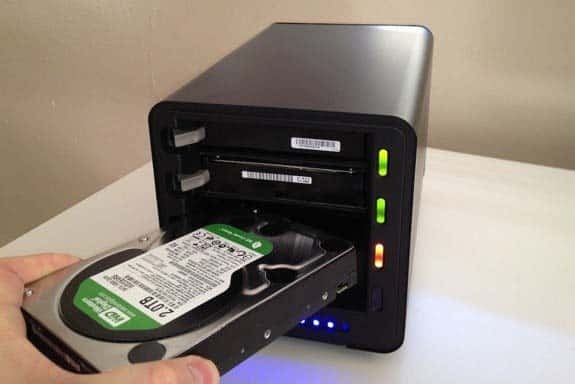 I’m thinking of getting a Drobo 5C (or something similar) to replace the Freecom drive, and then having another extrenal drive (per your diagram) as a 3rd backup.I’d like to store that drive somewhere different from my house. Did you consider other options apart from Drobo? Any thoughts on other options e.g Synology, G-Tech, or QNaP please? How do you do the auto backup to the ext drive shown attached to your Drobo? Any advice on drives to slot into the Drobo please? Wow, quite a few questions and I don’t blame you. This stuff can get complicated. At the time I purchased Drobo No.1 it was a first-generation unit but there wasn’t too much in the way of competition. What I liked about the Drobo was that I could recycle old hard drives because you can mix sizes and spin speeds. A lot of RAID technology won’t let you do this although it’s now more flexible. When I bought the second Drobo I did look around as some people were starting to criticise the Drobo. In the end I just decided to buy another because I had been so happy with the first. I did though consider buying a larger unit with network capabilities as I have a wired network – I wish I had invested the extra as it would have made live easier as all my computers could have shared it. There were some very good other network options available including wireless capability for laptops. I would recommend reading a few reviews. I think all of the options probably provide good storage and there’s no point paying for features you won’t use. I’m using Drobo because I like the features and it’s been reliable. The Drive I show backing up the Drobo isn’t connected directly to the unit. Both the Drobo and that drive are connected to my Mac. I then use Carbon Copy Cloner to backup part of the Drobo to the other hard drive. In terms of drives in the Drobos, I have quite a mix. There are drives that started life as single external hard drives that I removed from the external housing. I have also bought Western Digital Low Power, Toshiba High Performance and Seagate. I have all these spread across my Drobo units in various sizes. I just buy a recognised brand and buy the size that used to the largest on offer 6 months ago. These are usually much cheaper than buying the largest. If you’re on a budget, I would try to go for three drives rather than four. You can always add a fourth later. A good rule of thumb is that Drobos will allocate the largest drive in the group as a backup. If you buy 3 x 3TB your Drobo will have 6TB of available storage but spread across the three disks. There is a calculator on their website that will give you the exact numbers. Thanks very much indeed Robin. That’s been very helpful. No problem at all. I’m always happy to help when I can. Another quick question if I may please Robin – do you use Time Machine to backup what’s on your iMac HD and on your Drobo? I saw you’d had a problem in the past with Time Machine. I’m thinking that if the iMac sees multiple disks in the Drobo as one drive, I could use TM on my iMac and my iMac HD (much like I do today but with a single ext HD instead of the Drobo).I can also maybe get CCC to back up the Drobo contents to a HD that I’ll keep offsite. I do use TM to back up my iMac and MacBook to external HD’s. It is possible to use TM to backup the Drobo as well but I can’t find an external HD large enough. That’s one of the reasons I use CCC. It gives me sufficient control over the backup to just fit the essential elements from my Drobo to a 5TB HD. I actually have 2x5TB HD’s I use with the Drobo and keep one of these off site. Periodically I rotate the drives. The other nice point about CCC is it’s fast and you can control the scheduling. What you are proposing sounds very simmilar to how I have my iMac and Drobo storage set up. I like to keep things simple so can I ask…is the only reason you guys don’t just back up your Lightroom catalogue and original RAW photo’s to the cloud a financial one? For the size of my catalogue I think I can use the Cloud for about £6.99 per month which seems very reasonable. The cost of the storage isn’t the issue. It’s the speed of upload that’s the problem. Where I live, fibre isn’t yet available and although I have fast broadband, the upload speed is around 1Mb/s at best. My image library is about 5Tb or 5.2m Mb’s. That’s going to take around 0.5 – 1 year to upload if I leave my computer on all the time and don’t use the internet for anything else. The Drobo is a great storage choice but the number of variations is confusing. Unless you have a network and want to connect the unit so it can be shared by any computer on the network you don’t need the type N unit. These are units such as the 5N. Type C is a direct connection to a computer via USB and is what I have. Mine are only 4 bay units which I think they stopped making. You only need to put disks in two of the bays to get the system working and can add more as and when you can afford/need more space. The 5C DAS (Direct Access Storage – why do they make things so complex) is the equivalent of my units. It’s worth reading the Drobo site for advice on choosing the right unit http://www.drobo.com/resource-center/which-drobo-is-right/. I don’t have anywhere near as many images as you Robin but essentially my backup strategy/setup is pretty similar. I don’t need a Drobo, I just use a third disk and rotate them after adding new pics and bouts of editing etc. This is normally weekly, so far In 10 years I have never lost anything. The one thing I do do which may interest you is I have a portable 2Tb drive that I backup the whole Mac to using Carbon Copy Cloner. This means I have an exact copy of everything at a point in time which helps if you ever have to do a rebuild for any reason. Unless of course some problem has been introduced into the OS which is then replicated on the CCC backup, fortunately that hasn’t happened to me. It’s much quicker than a Time machine restore. It also serves as a safeguard against an OS or software update causing issues, I backup before a new OS release or Adobe update then if anything is causing a conflict after updating you have a known stable state to fall back on. You can start up from a CCC backup so if work was needed quickly you can resort to using it and sort the problem later. I’m not sure if there is a similar system for Windows users I’m afraid. I have both Time Machine and CCC running on my Mac to separate disks (3TB and 5TB). The problem I had was a faulty software install which was then replicated in the Time machine backup. It wasn’t that it didn’t back up correctly, it was the software wouldn’t restore because of the fault. I would have encountered the same issue with CCC. Good point about the hard disks which you can rotate. 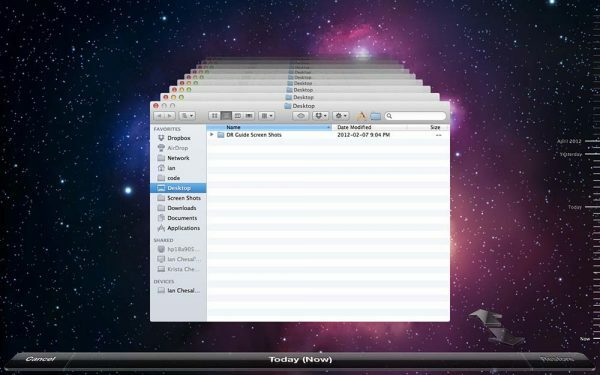 I used a similar backup arrangement for years: image files on a NAS as working storage, backed up to big USB drives, with Time Machine as backup for the computer (applications) itself. The weakness with this set up is that it’s all ‘on site’, and therefore at risk of local catastrophes like fire, electrical damage or theft. The answer? Add in off-site backup. I now back everything up to Google cloud storage. Google has highly redundant, massively encrypted storage, and isn’t likely to disappear any time soon. And Apple iCloud runs on Google cloud storage, so Apple must think it’s OK 😉. But you could use any of the other major companies – Amazon Web Services, Dropbox or whatever. Just as long as it’s ‘off site’. Yes, that’s very true. I would love to be able to put my images in the cloud but it’s not practical. I now have 5Tb of images in the main library. Given my upload speed is around 1GB/s it would take a long, long time. Can’t yet get fiber where I live which is quite a restriction.